It didn't clear 0 Deg F between New Year's Eve and Jan 9. "Only a fool would live here," grouses my darling. 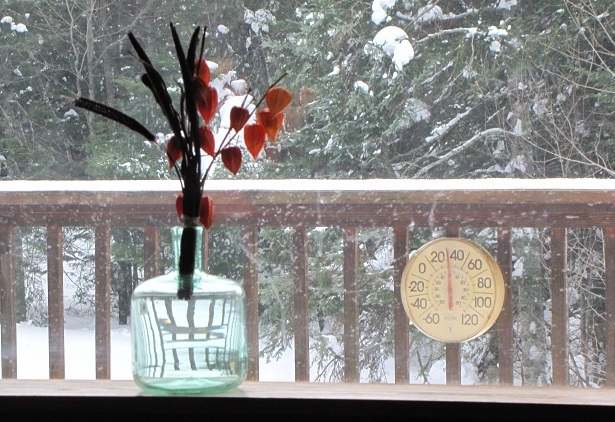 I take (an admittedly perverse) pleasure in the extreme swing of the seasons, particularly now that I don't often *have* to go someplace when it's too cold, and I can warm the house up with kitchen projects.1 That's what I plan for much of this week. Last week, during the harshest temperatures, there was a lot of baking and roasting and soup-making. This week is likely to be much of the same. 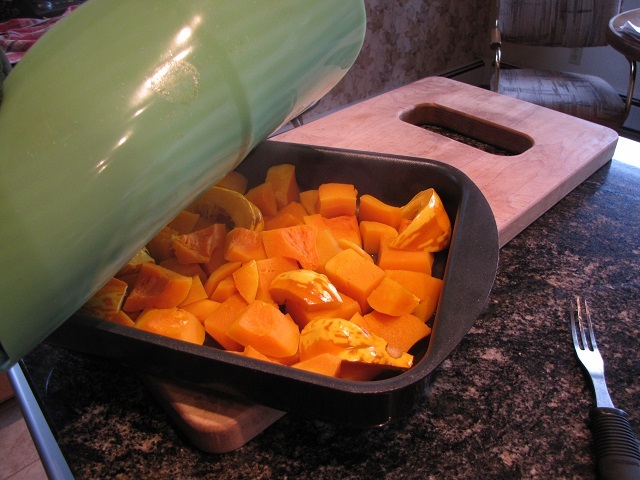 This afternoon's project is cutting and roasting squash to make a ravioli filling. These are the last of my butternut squash and a carnival squash from a neighbor down the road. The carnival will need to be peeled, but the butternut was very easy to peel before roasting. This squash filling is a recipe from the much-ballyhooed Amazon Link "Sauces and Shapes, Pasta the Italian Way" by Oretta Zanini de Vita and Maureen B. Fant. I've been enjoying the book's lively writing style, and this fall when I attempted ravioli for the first and second time they came out tasting very good, but looking terrible unless I used a mold. I'm not ready for the "free-form" pasta shapes they advocate yet. 1 Well okay, prolonged glamping in warmer climes also helps. What is that lovely green colored "thing" looming over your cut up squash? 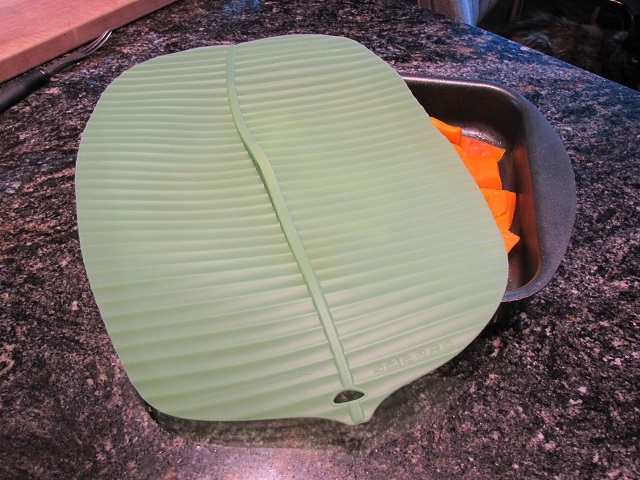 That is a Charles Viancin silicone "banana leaf" pan cover. 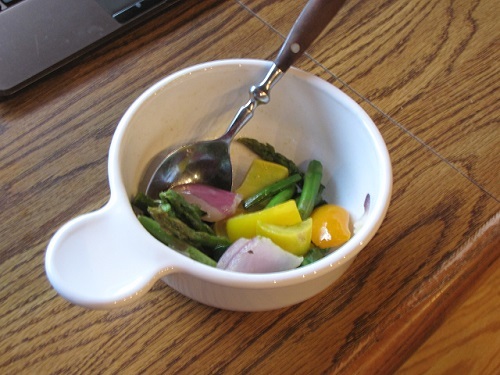 These things are wonderful: dishwasher safe, microwave safe, oven proof, flexible and (to my mind) whimsically pretty. They have a very smooth bottom so that they make a tight enough seal to a smooth-rimmed bowl or dish that nothing can come in unless you lift the lid. On the other hand they allow air out, so they're also good covers for things like proofing bread. I keep finding uses for different sizes and styles. i generally find the round shapes more useful, so have more lily pads. We're pretty casual about breakfast and lunch. Today we had leftovers from last night's "dinner and a movie" evening with friends. In the interests of keeping things simple (who, me?) I'd bought some fried chicken and oven-roasted vegetables from one of our supermarket delis. The chicken is nothing but bones and delicious memory, but there were vegetables left for lunch. I gave those silicone covers as Christmas presents this year. Naturally I had to get one for myself. I love how they come in so many colors and styles. I love the silicone covers. I have all sizes from mug size all the way up to a big one that will cover a large rectangular baking dish. So much easier to use than foil, when you have to add things at various times (or remove things). 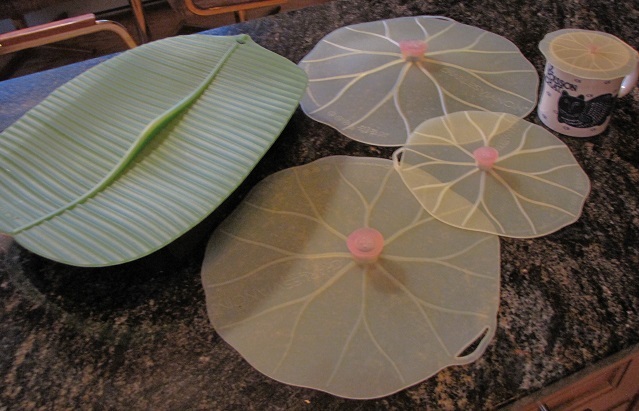 I especially like the Charles Viancin "lily pads" because they are translucent enough that you can see into them and the handles are brilliant. So anxious to see how your ravioli turns out. 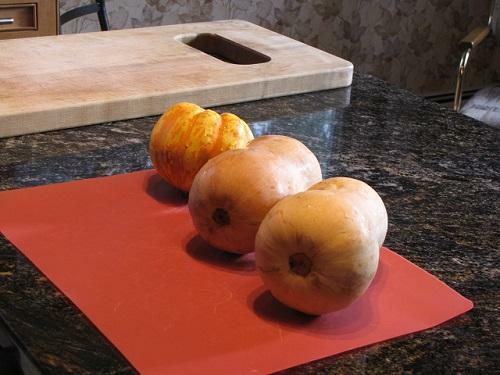 I've used Hubbard squash for ravioli filling and also for empanadas. Andi gives a good description of their utility. As for the temperature range, the label says Max +428 F /+220C; Min -40F / -40C. The label also says not for use over open flame or near "oven resistances". I do wonder whether the handles on the larger lily pads are sturdy enough to use for regular handing. I store the larger pads in a drawer rather than stress the handles too much. Do you know whether I'm being appropriately or overly cautious? I now have a beautiful, smooth squash puree thanks to a food mill. It seems a bit moist. The recipe says to use bread crumbs to thicken if necessary, but since I just realized I'm out of Parmesan cheese <scowl> I'm letting it drain prior to being put away for now. Actually it's too late for me to start messing with mixing fresh pasta dough and forming the raviolis tonight, anyway; I'm slow enough at all this that I tend to make the filling one day and use it a day or two later. I drained somewhere between 1/2 cup and 1 cup of liquid from the squash puree before putting it into the refrigerator. It's a beautiful orange color, and now as firm as I think the cookbook recommends. After several days of heavy meals, it was time for something light tonight. That's shorthand for saying it needed to be quick. 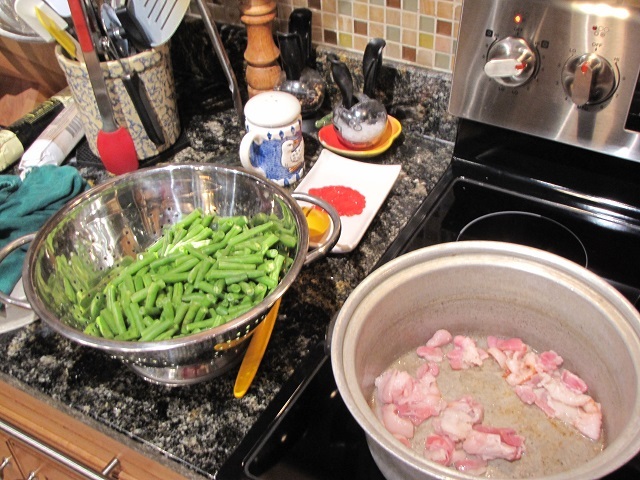 I trimmed some green beans, chopped some bacon, and began one of my favorite, time-honored methods of cooking green beans. This is more or less the method my grandmother used, and in her pot set, although I didn't simmer the beans nearly as long as she used to. When my darling used to travel routinely to Egypt for research, we discovered a then-new hotel in Luxor called the New Radwan Hotel. it was beautifully constructed, conveniently close to the train station and the hub of activity in town, and within easy walking distance of the Corniche (roadway and walkway along the Nile). The restaurant was outstanding. Once we began to express our admiration of the food, the chef and his staff went all out to impress us; our dinner plates were often garnished with tomatoes carved into roses or jack-o-lanterns, complete with lit candles. One of our favorite dishes there was a white fish drizzled with some sauce of lemon, butter, garlic, and - we were told - mustard, although it was too subtle for us to detect. Once we came home we tried - oh, how we tried - to duplicate that dish. The memory of the original has morphed as surely as our recipe, until we've had no choice but to rename it, from "New Radwan Fish" to "Roadway Inn Fish", with no disrespect meant to the USA motel chain. 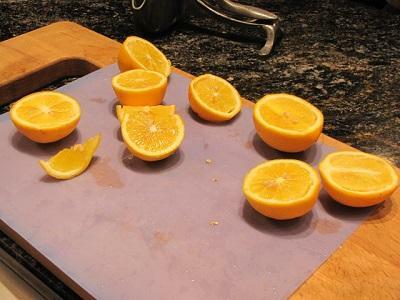 I have a pile of Meyer lemons, culled from a tree that froze badly during California's recent freeze. Meyers, with their sweeter flavor, come closer to the Egyptian lemons than the Lisbons generally raised where I grew up. 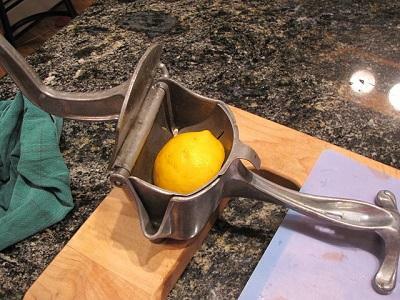 If you like using lemons or limes and can find a vintage lemon squeezer like this, buy it. Don't hesitate. I was appalled when, some years back, a new version of these was being sold for some $40 or $50. Mine is a family heirloom (some women inherit jewelry; I got the cookware) but I've found plenty like it on eBay and given them to friends who I knew would appreciate the gift. 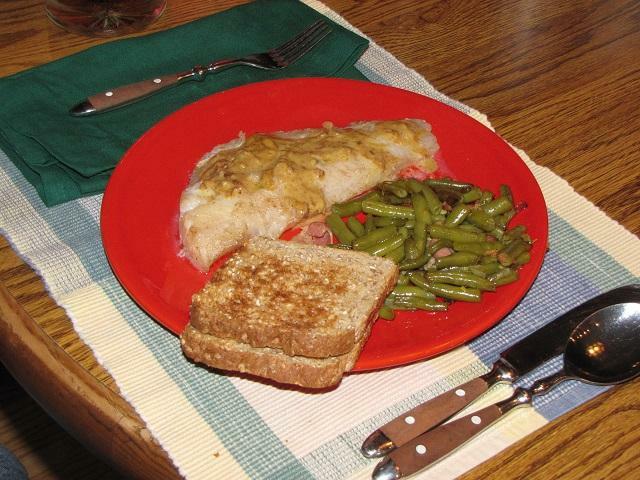 Dinner: Roadway Inn Fish, Green Beans and Bacon, and New England brand Brown Bread toast. Edited for spelling. No doubt I'll find some grammar thang as soon as I hit "save". A beautiful plate Smithy. What fish do you use for the dish? It looks tasty. Thank you! It was cod filet this time, but it also works with other firm-fleshed, mild white fish. By the way: Welcome to eGullet! I feel honored that you selected my blog for your first post. Thank you Nancy and I appreciate the welcome. I've been lurking for a bit. I am very active on a few other forums but those are almost exclusive to outdoor cooking. However your plate was a thing to behold this Sunday morning and thought I'd break my silence. Please keep the posts coming! Oh Nancy, I'm so glad you're blogging! I will be eagerly checking my computer for all of your beautiful pictures and descriptions. I've never seen those silicone covers before. Me thinks I might need to investigate those. Your green beans and bacon have me drooooooling. I wish I had some beans in the fridge so that I might copy your meal. Smithy: I enjoyed reading your posts in glamping, so I am happy to see you blogging this week. I've only used mine as covers for use in the microwave and washing by hand, but they are great! I'm hesitant to use them in the oven because there was no information on them, but I will definitely look for the pretty ones that you have. I assume they can be found in any kitchenware store? Can you provide more detail on the "New Radwan Fish"? I have 2 bags of Meyer lemons and would love to try this dish. I must also look for your juicer. My niece gave me one a few years back, and it's useless unless you're doing half a lime! Those silicone covers are getting to be easier to find. When I first discovered them - mid-summer 2012, I think - they were hard to find and the one store that carried them had trouble keeping them in stock because they were such hot sellers. Now they're much easier to find, and they probably can be found at almost any kitchen store. If not, they can certainly be purchased from Amazon: individually in different sizes and shapes, and sets as well. 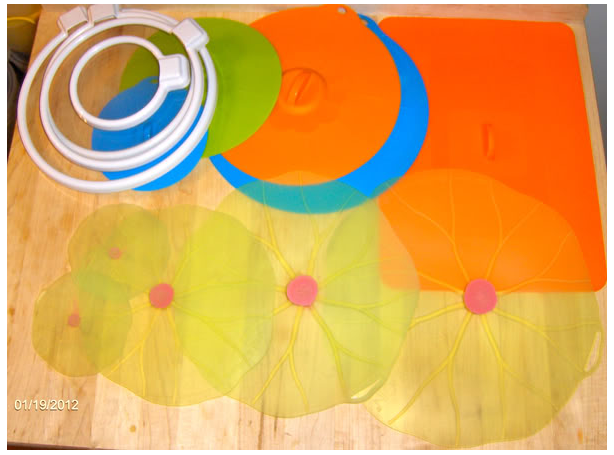 Here's a set: http://www.amazon.com/Charles-VIANCIN-Lilypad-Silicone-Suction/dp/B005RQ4WQA/ref=sr_1_1?ie=UTF8&qid=1389547007&sr=8-1&keywords=charles+viancin+silicone+lids The designs keep expanding: round shapes can be lily pads (still my favorite), hibiscus or sunflowers. Ooh, I just spotted red poppy rounds! Preheat an oven to a low (keep warm) setting - last night I used 175F - and put plates in it to begin warming. A warming drawer would also work, but mine is full of pans. Pat the fillets dry. (Sometimes I've seasoned them with salt and ground white pepper, but last night I didn't bother.) In a large pan, melt ~2 tbsp butter over medium-high heat. When it is melted and just starting to brown, add the fish. Cook just until brown, flip and cook until the other side is lightly browned. Remove the fish to the plates, and put them in the oven to finish cooking. Keeping the pan heat at medium high, pour in the lemon juice to deglaze. After the brown bits are scraped up and the pan bottom is clean, start adding butter, a couple of tablespoons at a time. Whisk, stir, or use some other implement to keep it mixing. At this point it pays to lower the heat so the sauce is just simmering and the butter doesn't burn. I had a very large pan last night, so the liquids concentrated quickly. Stir in the mustard. As the sauce cooks down, start adding water a few splashes at a time (if pressed, I'd say about 1/8 cup at a time, but it's arbitrary). The idea is to stretch the sauce so that it's not quite so concentrated on the lemon flavor but there's plenty to spoon over the fish. If you put in too much water it'll be thin, and will need to be cooked down. With too little water there won't be enough sauce. Remove the plates from the oven, drain off any water that may have come out of this fish as it finished cooking, and spoon the sauce over the fish. Serve and enjoy! This recipe is decidedly a work in progress. We keep records usually of what we did and what we thought, but at the moment I can't find them, nor could I last night. I thought the lemon was a bit too concentrated in the finished sauce - that's saying a lot for me - and my darling thought it perfect. That's unusual; as a rule I prefer things more tart and he prefers them more sweet. I tamed the tartness with salt at the table; he liked it as was but then added Worcestershire and liked that too. Sometimes we use more butter, more mustard, or something to thin the sauce other than water. I suppose the sauce could be thinned with something like broth, or possibly cream, but we've usually ended up with a broken sauce when we tried cream. Sometimes we chop garlic and add it to the sauce. The Trader Joe's Garlic Aioli Mustard Sauce (yes, I know that's a redundant name) is a favorite condiment we keep on hand, but one could use minced garlic and dijon mustard instead. It looks prettier if garnished with minced parsley, but I couldn't be bothered last night. I prefer a stainless steel pan for this cookery, so I can get a good fond for the sauce; my darling prefers a nonstick pan so he doesn't have to clean it. I use a whisk to keep the sauce incorporated; he hates dirtying up any more implements than he must, so he uses the spatula. I'm curious to see whether this explanation looks intelligible to any reader. If anyone has questions or comments, feel free to post them! Crikey, now it's raining outside. The road, our driveway, and the deck are becoming skating rinks. Half the roof load just let go in a calamitous avalanche that shook the house; fortunately nobody was outside. Now I need to go out and start clearing the deck before it freezes with that ice coat. 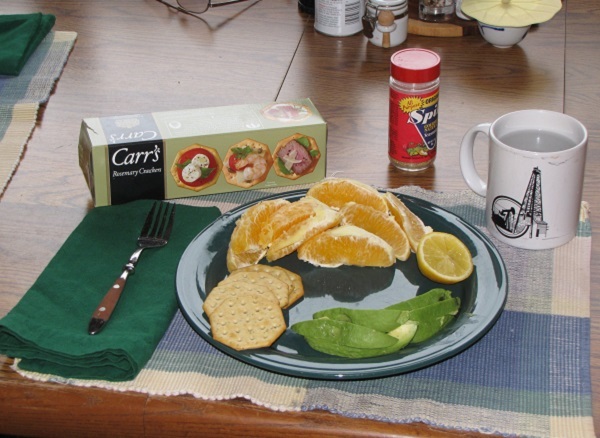 This morning's breakfast was fairly typical: sliced avocado mashed on crackers (my current faves are Carr's Rosemary), with a squirt of lemon juice and a sprinkling of Spike seasoned salt. Fresh orange slices on the side. I won't bother posting about this much during the week; some other day I'll post about my darling's breakfast. As I noted upthread, we're usually pretty casual about breakfast most days. Time to go shovel, and refill the bird feeders. That is a lot of lemon! - sound good to me. In terms of food supplies- what is your access to ocean fish? Also will we be seeing where you shop or have you everything in-house because of the weather? When we're at home in Minnesota, our ocean fish access is by way of the local grocery stores. We have a couple of stores and a butcher shop that get excellent fish and seafood. Some of it comes from locals who go up to Alaska and fish commercially during part of the year. In addition, there are the usual packages of frozen fish in the freezer section. I plan to be visiting my favorite shops and grocery stores during the week, and posting about them. I have to show off the area, now, don't I? ... Sometimes we use more butter, more mustard, or something to thin the sauce other than water. I suppose the sauce could be thinned with something like broth, or possibly cream, but we've usually ended up with a broken sauce when we tried cream. Hi, Smithy. Are you able to get your hands on whole fish ? Have you tried using the carcass for a quick stock (30 mins), reduced as appropriate and used to thin the sauce ? I posted about the silicone covers back in January 2012 when I took this photo. I don't use the ones in the upper left corner for microwave or oven, just on the counter or in the fridge for short periods. The big rectangular one on the right is 10 x 14 so covers a 9 x 13 baking dish with ease - made by Lekue. It's not as pretty as the banana leaf. I bought most of mine from Chef's Resource but also bought some at Amazon or other kitchen sites and also at the Lekue Factory outlet (since closed) at the "factory outlet mall" in Barstow, CA. I didn't see the red poppy lids but am Jonesing for the Hibiscus lids. Not that I need any more. Keep safe with handling the ice. 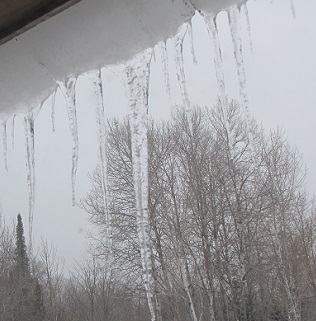 I can remember my stepdad using a garden rake to knock huge icicles off the eaves of the house in Wisconsin in which I lived for (thankfully) a very brief few years in the mid '50s. When some broke loose, it brought down others and a bunch of ice from the roof, nearly burying him. If he had been standing two feet nearer the drop line from the eaves, he would have been impaled by a huge icicle. 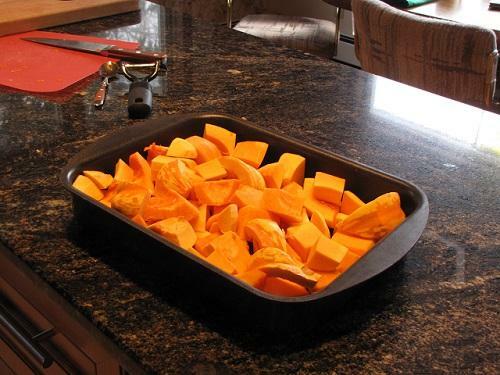 When I prepare squash or pumpkin for filling pasta or pastry, I spread it on a sheet pan, about 1/2 an inch thick and put it in a very low oven (175°F.) for 30 to 50 minutes. I find it deepens the flavor a bit, as well as drying out some of the moisture. So glad you are blogging. Will you feel comfortable showing us your kitchen? Blether, thanks for the suggestion. I don't usually get whole fish but it sounds like a good idea. Would you use aromatics in that stock? If so, which?